I've been trying to hone my skills with a bit of parchment grid work lace with white work and I'd forgotten just how long this takes. My original intention was to have a much wider lace section around this card but settled on less laciness (not sure that's a word) when I realised how much time it was taking. The result is far from perfect and doesn't bear close inspection - I'm not sure how people get them identical. For anyone who doesn't know, each little cross is cut out with scissors after piercing four little holes - quite therapeutic but requires some patience and reasonable eyesight. 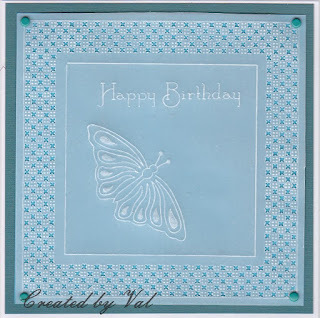 Apologies for yet another parchment card but rest assured I've not abandoned any of my other crafty techniques. 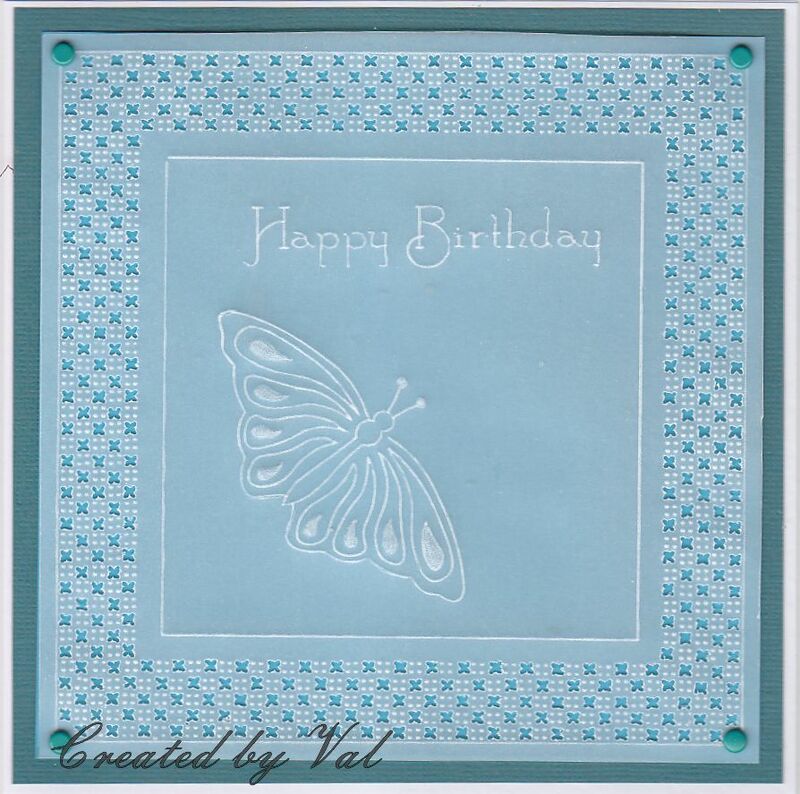 Worth taking the time though Val, this is a fabulous card and I love the work around the outside. I would have thought it was pretty near impossible to get everything identical! But to me yours looks just perfect. Thanks for your comment on my lastest post .. .. I was quite pleased my choccy box was already empty (it was actually passed on to me by someone who knows anything to store stash in comes in useful). Would you believe we will have Christmas chocolates hanging about!! It looks great Val. I use to love doing this cut work, not done any for ages.